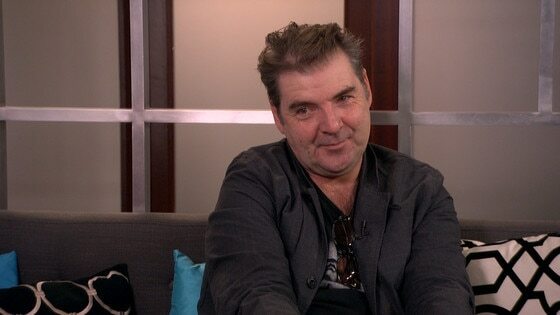 Fans of Brendan Coyle know him as Downton Abbey's lovable gent John Bates, and now, criminal boss Nelson Clay in Spotless, but what do we know about Brendan Coyle, the person? While sitting down to chat with E! News about his new dramedy on Esquire, the 51-year-old Irish/Scottish actor opened up about a personal matter—his father's sudden death. Coyle, who worked at a family butcher shop when he was younger and was only 17 years old at the time of the tragedy, recalled how his father's death was what motivated him to take a leap and pursue acting. "It's a bit weird. It's an awful thing to say that the death of my father was the catalyst for me to get out of town and move on, but it was," he tells E! News. "I never felt like I belonged where I came from. I worked at my dad's butcher shop from a young age and after I started school, I went to a meat factory and did all that. It's really weird, because I hated it at the time. I just wasn't cut out for it." Coyle's brother, Sean, is a master butcher and sometimes asks the star if he'd ever want to come back and return to the shop like old days. Surprisingly, Coyle isn't entirely against it. "I kinda do. It appeals to me. It's the thing that I hated when I was 16-17," he admits, but don't worry, acting has proven to be his true love. "Drama saved me," he added, but is very blunt on the fact that a passion for acting doesn't guarantee a fruitful career. "I did a Q&A at the New York Academy, and I was looking at them, and it's pretty brutal," the actor explains. "They're all great, but you just know that only 2 to 3 percent of those brilliantly talented people will make a career out of this." He continues, "I can't believe my luck. I'm up there with people who make a living out of it and play great parts." Don't miss an all-new episode of Spotless on Esquire tonight at 10 p.m.